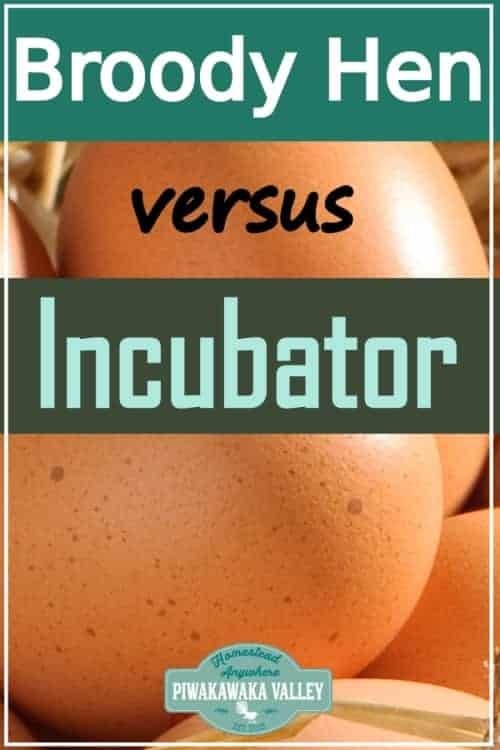 Broody Hen vs An Incubator - what is the best way to hatch chicks? Plastic Free Gifts – Ideas for all ages! 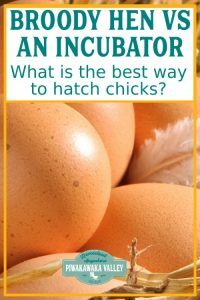 Broody Hen vs An Incubator – what is the best way to hatch chicks? Everybody loves the sight of baby chicks! And if you are looking for a sustainable flock, you are probably interested in hatching your own baby chicks. But what is the best way to hatch chicks? Are you better to use a broody hen or an incubator? If you want to hatch chickens at home, you will need to source some fertile eggs. You can often buy these online from breeders, or ask around friends and family. If you have a quality rooster and hens of your own, you might like to start your own little breeding set up. Remember, only 40-50% of the chicks that hatch will be girls. You need an exit strategy in place for the boys! Here we will explore the benefits and disadvantages of hatching chickens with a broody hen versus an incubator. Of course there is a third option, where you buy in day old chicks, and that is by far the easiest choice! If you have a chicken that has gone broody, she will sit on her nest all puffed up and get real grumpy when you come to try and take her eggs. She will barely leave the nest even to eat or drink. This is the time to sneak some fertile eggs under her. If you cover her head with a dark towel, she is less likely to freak out at you. Some breeds are better at going broody than others, and you can raise any hens eggs under any breed of hen and she will adopt them as her own. Old heritage breeds like orpingtons and light sussex are better at going broody than the commercial layer hybrids. Silkies are known as one of the BEST breeds to keep for raising eggs, they go broody twice per season usually. The hen turns the eggs, ensuring they each spend equal amounts of time on each side and rotate from the center to the edges of the nest for even warming. It’s said that broodies can detect non-fertile and non-developing eggs and will kick them out of her nest – no need to even candle the eggs. Since the rest of the flock will be used to the chicks being in the coop and run right from hatch, they are far more likely to accept them without any trouble. How cute is it to see a hen out with her babies!? Not all broodies make good mothers and once the chicks hatch, will sometimes lose interest in caring for them, or worse, maim or kill them, so you should have an indoor brooder box at the ready just in case. Chicks raised with mama will not be as friendly as hand raised ones. Broody hens will usually only go broody in the spring and early to mid summer which means you can only hatch in the spring and early to mid summer. If you’d like to hatch year round like I do, the better choice may be the incubator. A mama hen can only safely hatch 6-7 eggs for a bantam and 7-10 eggs for a large hen. Too many and some with get cold and you risk loosing the lot. Chicken egg incubators come in a variety of shapes and sizes. We dabbled with a homemade egg incubator but eventually forked out for one of these. You can get home incubators for as few as 6 eggs and up to several hundred. Of course the price is quite different between the different sizes as well. 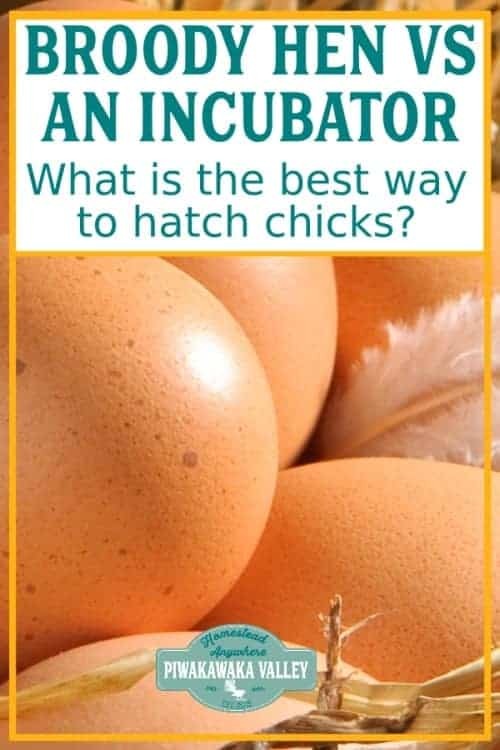 If you are looking to buy and incubator, try to get one that automatically changes the temperature and turns the eggs for you. You can watch the whole process happen in 21 days! You will need somewhere inside to keep the chicks for 8 weeks, then somewhere safe to get them to a decent size before you introduce them to the rest of the flock. Storing eggs is the same for broody hens and incubators, though you don’t have to store a broody hen’s eggs because she is capable of creating her own nest unless you want her hatching specific eggs. If she has already gone broody and there are no eggs under her, you will need to add some as once a hen is broody they stop laying. For storing, the eggs should be kept around 55 – 65 F / 10-15C. A good place to keep them is in a basement. Never put them in front of a window or anywhere that can heat up. Eggs should also be tilted daily while in storage to prevent the yolk from sticking to the side of the egg. Simply place a block of some sort under one side of the carton, and then move it to the other side the following day. Humidity should be kept around 60-75% during storage. Humidity levels aren’t that important, but it shouldn’t be too dry. You should also keep in mind that eggs can’t be stored forever. Their hatchability starts to decline after 7 days, though I’ve seen great hatch rates of eggs up to 14 days old. Do you need more delicious goodness fresh from the farm? Get exclusive content, discounts and updates. Would a silkie be helpful acclimating already hatched chicks to the ‘real world’? Hi Mike, if you have a broody silkie you can usually sneak day old chicks (or slightly older) under them and most will foster them without issue. Hello and welcome, I’m Dana. I want to help you make your self-sufficient dreams a reality. Find out more about us here. Please remember to follow us and join our newsletter! Piwakawaka Valley Homestead is here to help you learn exactly how you can homestead anywhere. Homesteading is a mindset, a way of life – Get in to it! In order for me to support my blogging activities, I may receive monetary compensation or other types of remuneration for my endorsement, recommendation, testimonial and/or link to any products or services from this blog. See our Disclosure statement for more information. Grab your freebies! Herbal Medicine eBook, Sourdough tips sheet AND a list of nitrogen fixing plants. Sign up for our Fresh From the Farm newsletter and get our exclusive content, discounts and updates. All goodness. No spam.